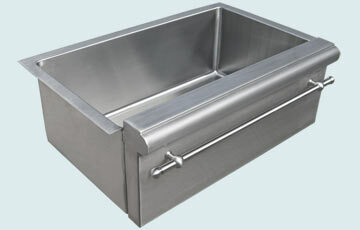 Custom stainless steel special apron sinks from Handcrafted Metal allow you to accommodate your specific design needs. 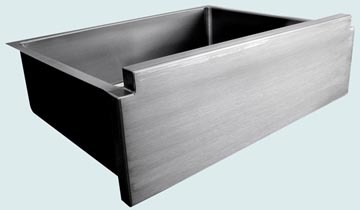 We can make you a stunningly beautiful sink by creating a special apron for it. 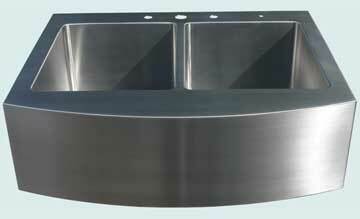 Each feature can be customized, including the number, shape, and size of the bowls. 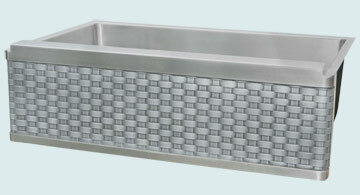 For example, an eye-catching apron such as a curved apron, raised apron, bullnose apron, or a framed apron, will add that unique custom touch to your sink. 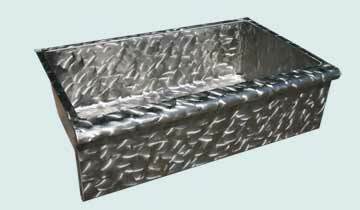 Every stainless steel sink is fully welded and polished, and made from high-quality 14 gauge stainless steel, which is 25% thicker than 16 gauge. Also, each sink has coved corners inside for easy cleaning, and can be made with drop-in mount, under mount, or flush mount rims. 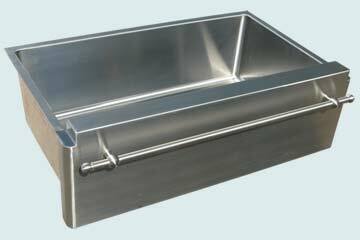 Additionally, if you need the apron front of your stainless sink to fit with existing cabinetry, we can make it match perfectly! 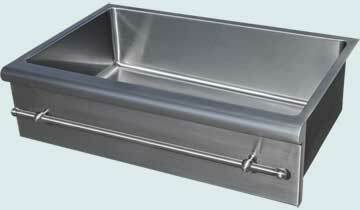 Click on any sink below to see more pictures, and customize it according to your specifications! The apron of this large, beautiful sink is raised to match the stone counter top. The towel bar is installed close to the top for easy access. It has our Micrograin finish, which gives the sink shine. This hand woven apron is raised to match the stone counter top. The sink is 14 gauge stainless steel with our micrograin finish, and the woven apron insert is zinc with our medium patina. The beautiful butterfly finish is the most distinctive feature of this eye-catching sink. The apron is square style with a bullnose at the top to match the countertop. 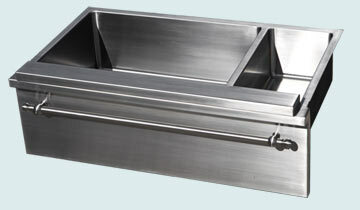 The sink is undermounted and made from 16 gauge stainless steel. The top of this apron is raised and rounded to match the counter top edge. A towel bar across the front is practical and lovely. One bowl is smaller and more shallow to be used for veggie prep. The entire sink has our Micrograin finish on 14 gauge stainless. There is a small extension at the top of the bullnose formed on this apron. It matches the look of the stone counter top that will surround thie sink. A towel bar below the bullnose is practical as well as lovely. Micrograin finish is on the 14 gauge stainless. The curved apron front is the prominent feature of this fabulous drop-in sink. Both bowls are equal in size and are ten inches deep. Faucet holes are on the back deck. It has our Micrograin finish on 14 gauge stainless. 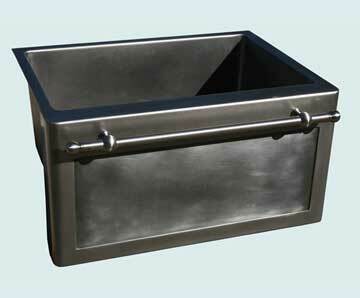 With an apron across two sides of the sink, this piece fits on an outside corner of the counter top. Faucet holes will be drilled into the stone counter top at the rear in the center. It has our Micrograin finish on 14 gauge stainless. This traditional single-bowl undermount sink has a towel bar on the front and a bullnose front edge. 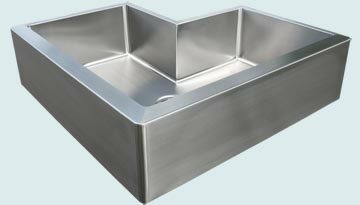 The entire piece is made from 14 gauge #304 stainless steel and has our micrograin finish. The corners are rounded on this frame-style apron. A towel bar is positioned above the zinc panel inside the frame. It has our Matte finish on the stainless, which complements the Medium antique patina on the zinc panel.